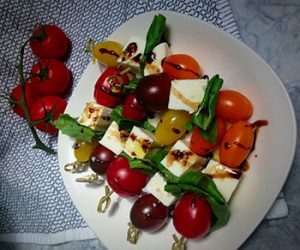 Using wooden skewers, layer the tomatoes, cheese, and basil on sticks. Pour some balsamic vinegar into a saucepan and simmer for about 10 minutes or until it has been reduced in half into a syrupy texture. Drizzle the balsamic reduction over the skewers, along with olive oil, salt, and pepper. Enjoy! Brush each piece of phyllo dough with melted butter. Stack about 10 pieces on top of each other and lay flat on a baking sheet to form a crust. Mix the cream cheese, mayo, scallions, chopped basil, cheddar cheese, garlic powder, salt and pepper. Coat a thin layer of filling over the phyllo dough, leaving 1/2 an inch border as a crust. Cut the heirloom tomatoes in half, salt them, and lay out on paper towels to drain. 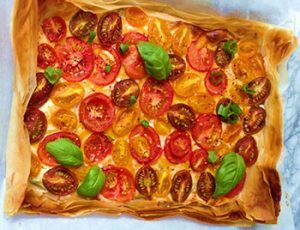 Pat the tomatoes dry of excess juices, then arrange in a pretty pattern on top of the cream cheese mixture. Top with some extra salt and pepper and bake for about 25 minutes or until golden brown and crispy. Enjoy!